October 2016 saw the launch of our new gravity roller conveyor system and one of the first customers to take advantage of this was a market leading composite door manufacturer based in South Yorkshire. In order to cope with increased demand, the client has invested heavily recently in machining tools and other process related hardware, including our gravity roller conveyor systems. 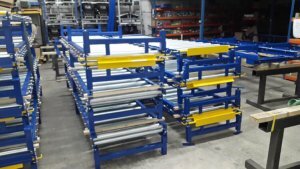 As we were literally working with a blank canvas, we first needed to understand the process flow from first receiving the raw material blanks, right through to handling the finished product. 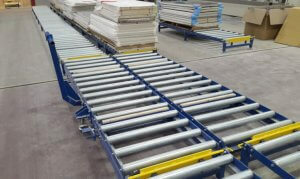 As there was a requirement for doors to visit every part of the process, a series of transfer trolleys were required to connect palletised doors to the network of straight runs throughout the manufacturing facility. 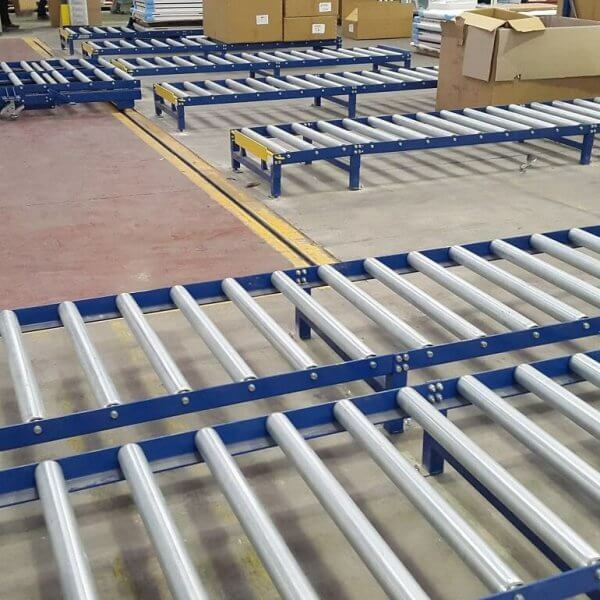 Access to CNC machines, beam saws, edge banders, fladder systems and spray shops were required as well as the ability to convey the final product to the goods receiving area ready for stock, or out for despatch. Our in-house design team set about creating a floor plan layout of the solutions required. 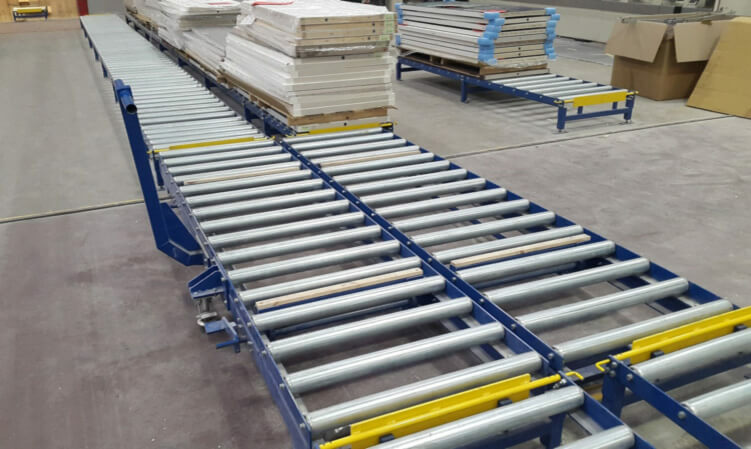 It was decided that in order to obtain maximum process efficiency, a varied range of non-powered roller products were needed including 5 twin transfer trolleys complete with over 90 metres of rail, a rotating loading station, and over 200 metres of 800mm wide gravity roller conveyor. This particular system was the first supplied that incorporates our newly designed self-levelling flip stops. This simple but effective design allows ease of use and minimises potential health and safety issues regarding trap points etc. 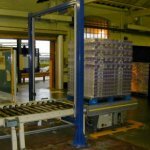 Once the order was received, manufacture of the full system took around 6 weeks with a further week to build the system in-house into transportable modules. This was required so as to keep disruption to client operations down to a minimum. 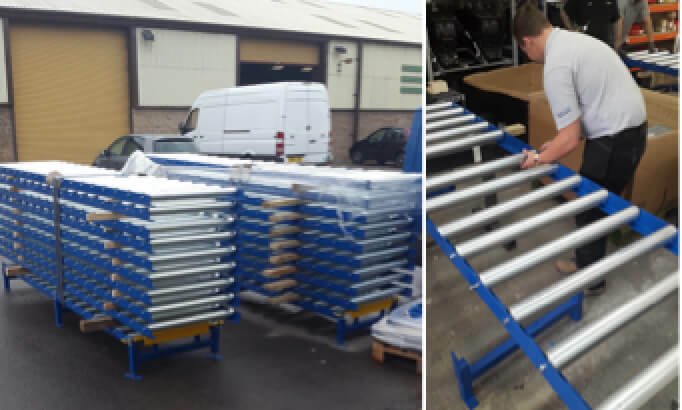 Once we arrived on-site, installation took place in just one week with the ‘snagging’ list completed as required shortly after. Our client is now looking forward to a significant increase in site efficiency and it is anticipated that the newly installed system will pay for itself in a matter of months.